All of the products mentioned in this post have a matte finish. 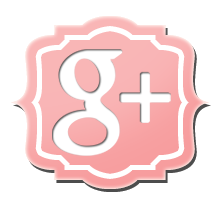 Some shades are more suitable for contouring, while others work better for bronzing. Even though I have a warm NC30/35 skintone, I prefer to use cooler shades to contour my face because it creates a more natural looking shadow. When bronzing my face, I prefer to use warmer shades because cooler shades can make me look dirty or sick. 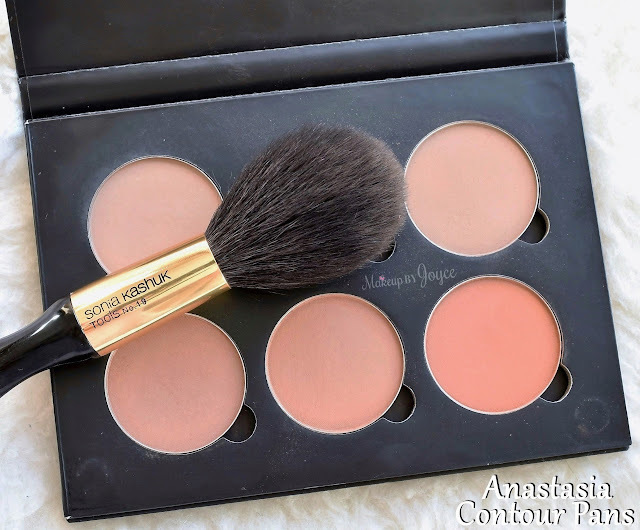 Anastasia Beverly Hills Contour Refill (each pan retails $14 for 3g/0.11oz) - I bought 6 contouring shades and paid a discounted price of $40. The cardboard palette was included for free. 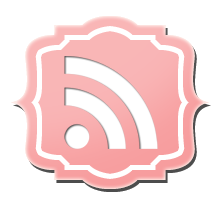 (It measures 5.75" x 4" and is about less than half an inch thick.) They also have highlighting shades with different finishes. You can choose from over 25 colors and mix & match them however you like. They also come in 3 different pre-made kits, including Light to Medium, Medium to Tan and Tan to Deep, for $40 each. Currently, the refill pans are not sold individually in a compact. If you don't purchase them in a set of 6, then you will have to find a place to store them, such as a Z Palette. The Anastasia pans are bigger than the MAC eyeshadows and smaller than the MAC blushes, so they won't fit in the MAC inserts, but can be stored in the MAC palettes if you remove the insert and attach a magnet. Fawn is a tawny and is suitable as a contour shade for lighter beauties. Ash Brown is a cool medium brown and is darker than Fawn. Mink is a deep taupe and is a smidgen darker than Ash Brown. Both Ash Brown & Mink are great as a contour shade for medium skintones. Java is a warm medium brown. Clay is darker and warmer, while the Trish McEvoy one is more red-based compared to Java. Havana is a warm russet and is more brown compared to Clay. Clay is a deep red brown. Java, Havana and Clay all work well for bronzing the face. Fawn, Java & Havana Ingredients: Talc, Mica, Silica, Boron Nitride, Magnesium Stearate, Ethylhexyl Palmitate, Nylon-12, Octyldodecyl Stearoyl Stearate, Dimethicone, Triethoxycaprylylsilane, Tocopheryl Acetate, Caprylyl Glycol, Ethylhexylglycerin, Phenoxyethanol, Methylparaben, Propylparaben. May Contain (+/-): Iron Oxides (Ci 77491, Ci 77492, Ci 77499), Titanium Dioxide (Ci 77891). Ash Brown Ingredients: Mica, Dimethicone, Zinc Stearate, Boron Nitride, Cyclopentasiloxane, Lauroyl Lysine, Nylon-12, Polymethylsilsesquioxane, Ptfe, Aluminum Hydroxide, Hydrated Silica, Pyrus Malus Fruit Extract, Ascorbyl Palmitate, Glycerin, Polysilicone-11, Silica, Tocopheryl Acetate, Isopentyldiol, Phenoxyethanol, Caprylyl Glycol. May Contain (+/-): Yellow 5 Lake (Ci 19140), Blue 1 Lake (Ci 42090), Ultramarines (Ci 77007), Carmine (Ci 75470), Iron Oxides (Ci 77491, Ci 77492, Ci 77499), Titanium Dioxide (Ci 77891), Chromium Oxide Greens (Ci 77288). Mink Ingredients: Stearoyl Stearate, Dimethicone, Triethoxycaprylylsilane, Tocopheryl Acetate, Caprylyl Glycol, Ethylhexylglycerin, Phenoxyethanol, Methylparaben, Propylparaben. May Contain (+/-): Iron Oxides (Ci 77491, Ci 77492, Ci 77499), Titanium Dioxide (Ci 77891). Clay Ingredients: Mica, Talc, Boron Nitride, Nylon-12, Silica, Ethylhexyl Palmitate, Magnesium Stearate, Triethoxycaprylylsilane, Caprylyl Glycol, Dimethicone, Ethylhexylglycerin, Methylparaben, Octyldodecyl Stearoyl Stearate, Phenoxyethanol, Propylparaben, Tocopheryl Acetate. May Contain (+/-): Iron Oxides (Ci 77491, Ci 77492, Ci 77499), Titanium Dioxide (Ci 77891). For swatches of the blushes, click here. Mac Sculpting Powder in Shadowy ($17 for 6g/0.21oz) - It's only available in pan form on MAC's online store, so you'll have to find a home for it. The pan fits in the MAC Blush Insert ($2), so I store it in my Pro Palette ($8). Color: Shadowy is a deep cool-toned brown with a matte finish. Sculpt is more suitable for lighter beauties, while Definitive is more suitable for darker beauties. Kevyn Aucoin's medium shade is more grey, while Too Faced's Chocolate Soleil is more warm compared to Shadowy. 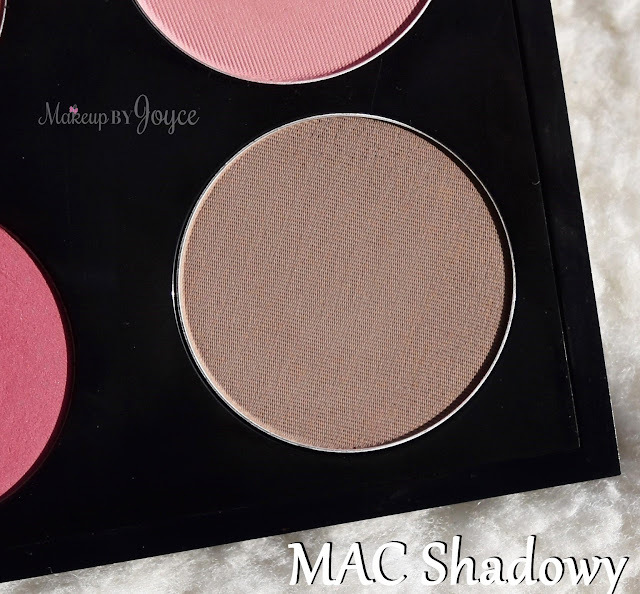 I use Shadowy mainly for contouring when I want a more defined, chiseled look. Ingredients: Talc, Nylon-12, Octyldodecyl Stearoyl Stearate, Zinc Stearate, Isostearyl Neopentanoate, Ascorbyl Palmitate, Tocopheryl Acetate, Hordeum Vulgare (Barley) Extract, Triticum Vulgare (Wheat) Germ Extract, Squalane, Tin Oxide, Caprylyl Glycol, Magnesium Myristate, Hexylene Glycol, Phenoxyethanol, May Contain (+/-): Mica, Titanium Dioxide, Iron Oxides (CI 77491, CI 77492, CI 77499), Carmine (CI 75470), Red 6 (CI 15850), Red 7 Lake (CI 15850), Ultramarines (CI 77007), Yellow 5 Lake (CI 19140). 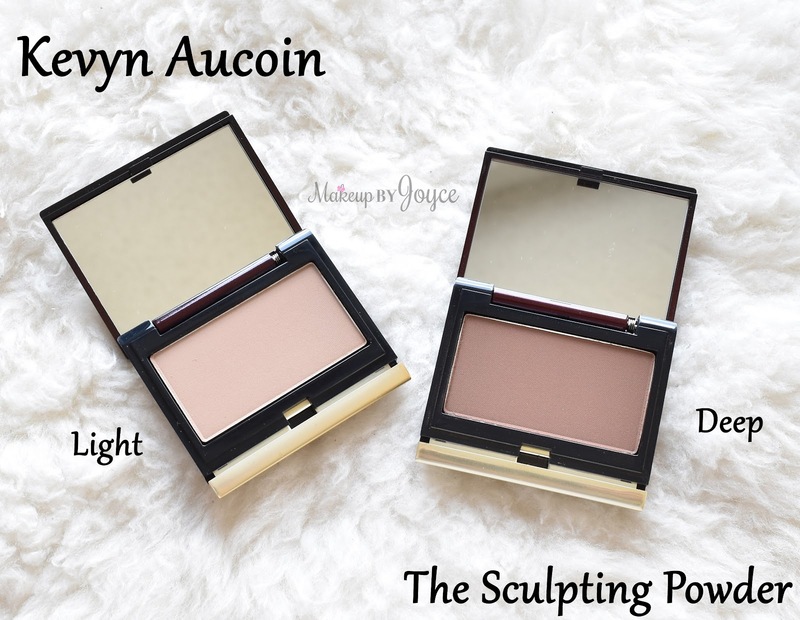 Kevyn Aucoin The Sculpting Powder ($44 each) - The compact is very small and is about 2.25 inches x 2 inches, which makes it very travel friendly. Color: The Sculpting Powder comes in 3 cool-toned shades, including Light (4g/0.14oz), Medium (3.1g/0.11oz) and Deep (4g/0.14oz). Light is most suitable for those who are very fair. Medium works best for my NC30/35 skin tone as a contour shade. I thought Deep could work well as a bronzer for me, but it's not warm enough and works best as a contour shade for darker beauties. Light & Deep Ingredients: Nylon-12, Talc, Mica, Phenyl Trimethicone, Hydrogenated Lecithin, Tocopherol, Caprylic/Capric Triglyceride, Laminaria Ochroleuca Extract, Hexylene Glycol, Caprylyl Glycol, Phenoxyethanol. May Contain (+/-): Iron Oxides (CI 77491, CI 77492, CI 77499), Titanium Dioxide (Cl 77891), Yellow 5 Lake (Cl 19140), Ultramarines (Cl 77007), Carmine (CI 75470). Medium Ingredients: Talc, Polyethylene, Nylon-12, PTFE, Phenyl Trimethicone, Methylparaben, Propylparaben. May Contain (+/-): Iron Oxides (CI 77491, CI 77492, CI 77499), Manganese Violet (CI 77742). 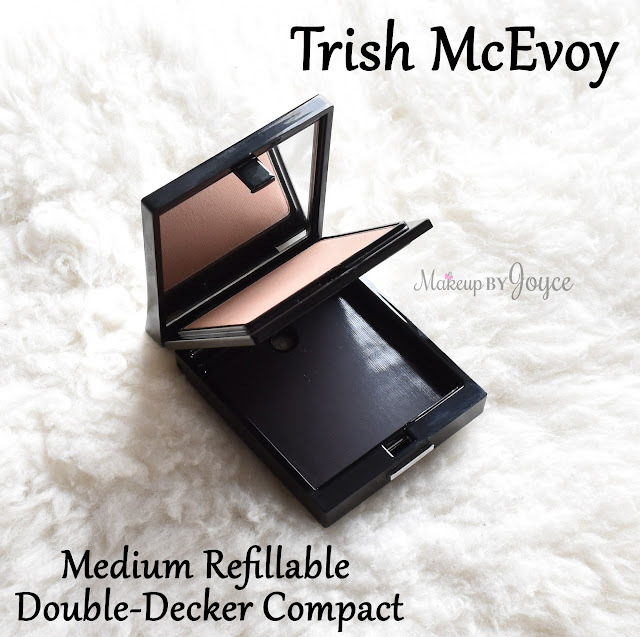 Trish McEvoy Matte Powder Bronzer Refill in Medium ($32 for 7g/0.25oz) - The Medium Refillable Double-Decker Compact ($20) is sold separately and has 2 levels. Each level can hold 4 Trish McEvoy eyeshadows, 2 blushes, one bronzer, one powder foundation or one finishing powder. The compact has a strong magnet that allows the pans to stay locked in place, but they're also easy to rearrange and pop out because each level has a hole in the back. You can also place the pans in the MAC palettes if you remove the insert and attach a magnet. Color: It has a more red undertone compared to all the other shades and is ideal for bronzing & warming up the face. Ingredients: Talc, Silica, Zea Mays (Corn) Starch, Polyethylene, Tricaprylin, Zinc Stearate, Tocopherol, Methylparaben, Propylparaben, Ascorbyl Palmitate. May Contain (+/-): Iron Oxides (CI 77491, CI 77492, CI 77499), Ultramarines (CI 77007), Titanium Dioxide (CI 77891), Bismuth Oxychloride (CI 77163), Chromium Oxide Greens (CI 77288), Chromium Hydroxide Greens (CI 77289), Carmine (CI 75470). Too Faced Soleil Matte Bronzer in Chocolate ($30 for 10g/0.35oz, also known as Medium Deep) - I had the same one for years. It still smells like real cocoa when I sniff the pan, has not changed in texture or color, and has never broke me out. (I sanitize it with alcohol from time to time.) I have mine in the old packaging with a dark brown case. The new compact is gold. A little goes a long way, which is why it has taken me forever to hit pan. Color: Chocolate looks warmer when compared to Kevyn Aucoin's medium, Anastasia Mink and MAC Shadowy, but it's by no means orange. It works well as both a bronzer and contour powder. It also comes in Milk Chocolate for lighter beauties and Dark Chocolate for deeper skin tones. Ingredients: Talc, Mica, Ethylhexyl Palmitate, Octyldodecyl Stearoyl Stearate, Zinc Stearate, Boron Nitride, Sodium Saccharin, Sodium Dehydroacetate, Phenoxyethanol, Silica, Benzyl Benzoate, Flavor (Aroma), Theobroma Cacao (Cocoa) Fruit Powder, Tocopherol, Ascorbyl Palmitate, Benzyl Alcohol. May Contain (+/-): Titanium Dioxide (CI 77891), Iron Oxides (CI 77491, CI 77492, CI 77499), Manganese Violet (CI 77742). Application: When working with powder products, I prefer to use brushes made of natural hair because they disperse product evenly and blend effortlessly. 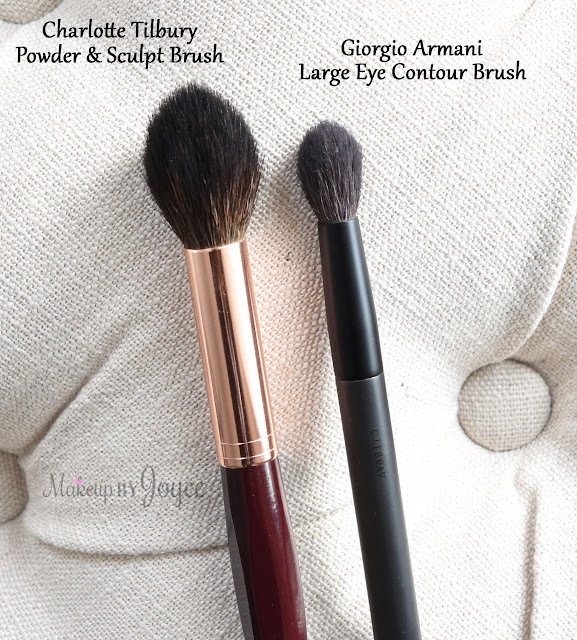 I've been using the Charlotte Tilbury Powder & Sculpt brush (review) to contour my cheeks. I love how it fits nicely on the hollows of the cheekbone. When contouring my nose, I've been reaching for my MAC 217, and blending the harsh lines with my Giorgio Armani Large Eye Contour brush (review). The formula of the Trish McEvoy powder is the most mistake-proof. I can apply it blindly without the fear of looking like I had dirt or mud thrown at my face! It has sheer pigmentation and still looks very natural when layered. All the other ones can be applied sheer for a natural finish or applied heavily for a dramatic effect. Powders that are soft generally apply smoother onto the skin and are easier to blend. They also can get more dusty in the pan and cause you to hit pan faster. 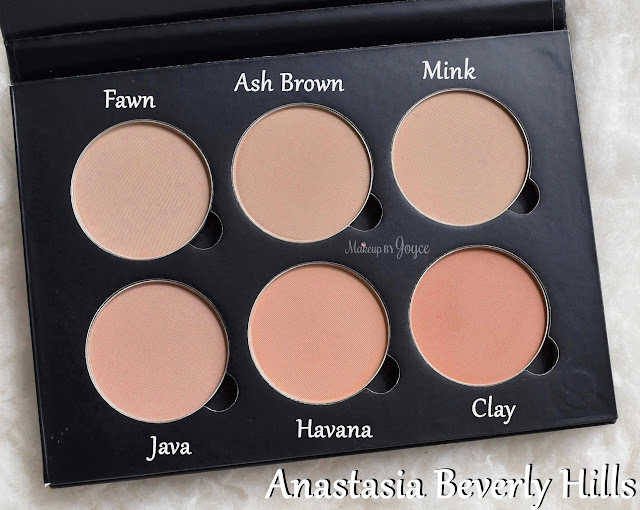 The Anastasia powders in Ash Brown, Java, Havana and Clay, are the softest out of the bunch without getting too dusty in the pan. The rest of the powders mentioned in this post may not be as soft, but they still apply smoothly without any blotchiness and blend easily. Another thing worth mentioning is that the Anastasia pans are the smallest of the bunch. I don't have any issues dipping my Charlotte Tilbury brush in the pans when I'm using them as contour powders. I just wish the pans were a little bit bigger so it'll be easier to dip a large fluffy brush like the Sonia Kashuk #19 (comparison pictures) when I'm using them as bronzers. I end up having to roll the brush around the pan in order to get all the bristles evenly coated with product. It's not a deal breaker, but will make application easier if the size of the pan was bigger. Longevity: I don't have any issues with makeup lasting on the outer perimeter of my face and cheeks in general. All of these powders last at least 10 hours when worn over foundation and setting powder. Bottom Line: The Anastasia Contour refills provide the most bang for your buck if you purchase 6 shades ($2.22/g) and is great for those who want to purchase a wide range of contouring & bronzing shades. 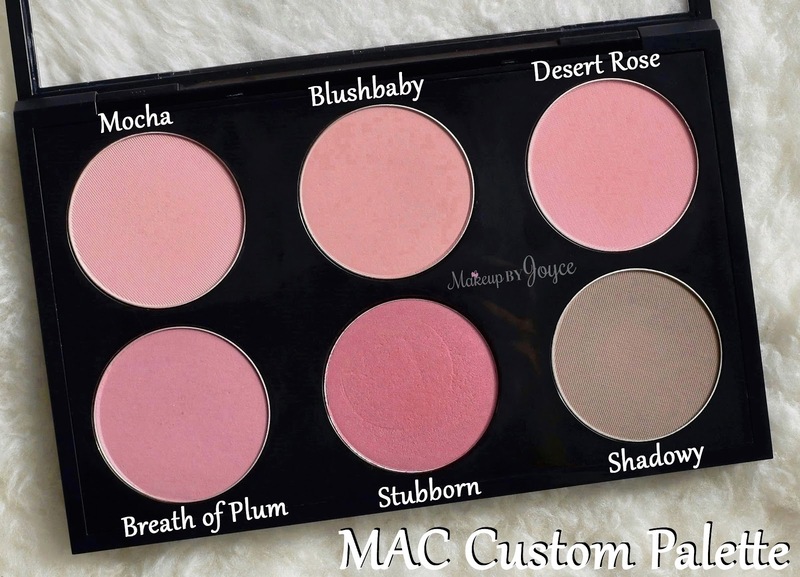 The MAC Sculpting Powder ($2.83/g) is convenient for those who already have a MAC empty palette. The Too Faced Chocolate Soleil ($3/g) is ideal for those who want a 2-in-1 shade that can be used both as a contour and bronzer. 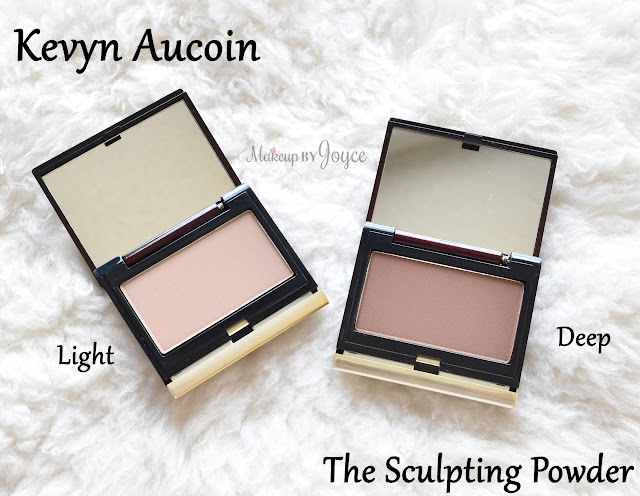 The Kevyn Aucoin sculpting powders are great for those who travel light, while the Trish McEvoy one is great for those who want a mistake-proof bronzer, even though both are on the higher end of the price range. 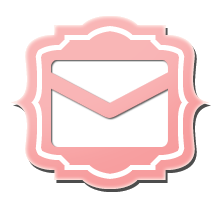 They all provide excellent quality in terms of application and wear. What it comes down to is your personal preference for packaging. 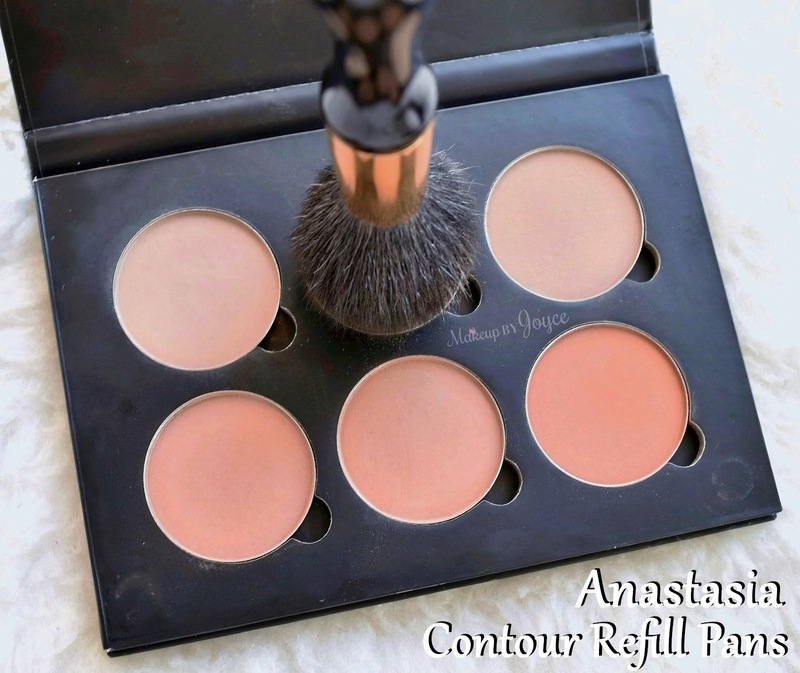 Note: The Anastasia Beverly Hills Contour Refills can be purchased individually at Sephora and Ulta. The Anastasia Beverly Hills pre-made Contour Kits are available at Sephora, Ulta, Nordstrom and B-Glowing. The MAC Sculpting Powder is available at MAC Pro Stores and on their online store. The Kevyn Aucoin Sculpting Powder is available at Sephora, Nordstrom, B-Glowing, Beauty.com, SpaceNK and DermStore. The Trish McEvoy Matte Powder is available at Nordstrom. The Too Faced Soleil Matte Bronzer can be purchased on their online store, Sephora, Ulta and Beauty.com. Hi I was thinking about buying the Kevin Aucoin Sculpting deep but I rather save money with Anastasia contour palette. I was wondering what shade in Anastasia would be close to the Kevin Aucoin deep? Thanks. The Anastasia shades that I have are all lighter than Kevyn Aucoin's Deep. Looking at the list of all of Anastasia's shades, Carob seems to be the darkest contour powder with a cool undertone that they sell. Hope this helps! Wondering if you could offer any advice... I love Mac's shadowy - I have darker skin and it's my perfect contour shade. My skin is just not reacting well to powders these days (or the powders aren't reacting well to me!) and I've switched to all liquid and cream products, which are sitting much better. Do you know of a good cream alternative to shadowy? I was thinking about the Bobbi Brown stick foundation in 'cool espresso' but I can't find it to test it out... Any advice would be appreciated! Cool Espresso by Bobbi Brown is a great contour shade for deeper beauties. The main difference between Cool Espresso and Shadowy, besides the formula, is that Shadowy leans more cool toned, but you'll still be able to create a chiseled effect with Cool Espresso because it's by no means warm. Hi Paola, I recommend getting Kevyn Aucoin's medium shade because it's closer to ABH's Fawn when swatched heavily. 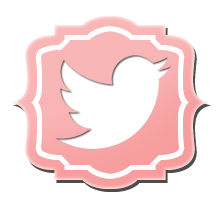 (It's just slightly darker and more cool toned, but will still work with your skin tone.) For a lighter and softer look, you can use it with a light hand. It's actually very versatile, especially for your skin tone. Hey, I was looking to buy the Kevyn Aucoin sculpting powder. However I wasn't sure which shade would suit me best. I have Indian skin with a yellow undertone, and I currently contour with a mix of 'shadow play' and 'subconscious' from the Kat von D shad and light pallet. Any advice? Go with the medium shade for Kevyn Aucoin's sculpting powder! 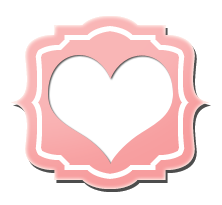 =) Deep is going to be too dark for your complexion, since you're mixing Shadow Play and Subconscious. Hello, i am an nc 40 -42... would you recommend kevin aucoin in deep?